The following article is an excerpt from a five-part lesson on Advent, Christmas, and Epiphany, which can be found on Catholic Online. Be enlightened, be enlightened, O Jerusalem, for thy light is come, and the glory of the Lord is risen upon thee, Jesus Christ, born of the Virgin Mary. The Epiphany takes its name from the Greek “epiphania,” which denotes the visit of a god to earth. The first idea of the feast is the manifestation of Christ as the Son of God. 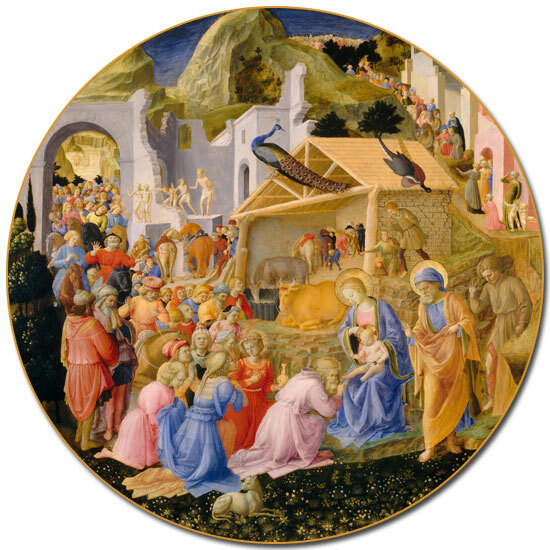 “Begotten before the daystar and before all ages, the Lord our Savior is this day made manifest to the world.” The feast unites three events in the life of Christ when His divinity, as it were, shines through His humanity: the adoration of the Magi; the baptism of Christ in the Jordan; and the first miracle at the wedding feast of Cana. Moreover, at Epiphany the Church looks forward to the majestic coming of Christ on the “youngest day” when His manifestation as God will be complete. The Gospels of the baptism and the marriage at Cana are read on the Octave Day and the Second Sunday after Epiphany, and later Sunday masses in the Epiphany season continue to show the divine power of our Lord in some of His most striking miracles. A second important idea in Epiphany is the extension of Christ's kingship to the whole world. The revelation of Christ to the three kings at Bethlehem is a symbol of His revelation to the whole of the Gentile world. Epiphany presents to us the calling of not merely a chosen few, but all nations to Christianity. Closely linked to both these themes of divine manifestation and world kingship is a third idea running through the Epiphany feast: that of light. During Advent, the world was in darkness, and we prayed and waited in the spirit of the Jewish nation which lived in expectation of the Coming Light during thousands of years. At Christmas the Light shone forth, but dimly, seen only by a few around the crib: Mary and Joseph and the shepherds. But at Epiphany the Light bursts forth to all nations and the prophecy is fulfilled: “The Gentiles shall walk in Thy light, and kings in the brightness of Thy rising.” The mysterious star of Epiphany, “flashing like a flame,” is still another facet of the light-motif, a symbol capable of being interpreted in a dozen different ways. Moreover, Epiphany demands that like these kings we should return to our own countries a different way, carrying to all those we meet the light of Christ. “For behold, darkness shall cover the earth,” says the Epistle of the Epiphany Mass, “and a mist the people: but the Lord shall arise upon Thee, and His glory shall be seen upon Thee. And the Gentiles shall walk in Thy light...” These words may be applied to us, upon whom the light of Christ has indeed risen, and who have the responsibility to radiate that light in the darkness of our own world. It is clear how much the feast of Epiphany must mean to all who are engaged in the apostolate and are striving to extend the kingdom of Christ. Besides the important ideas outlined above, there is still another great theme threaded through the Epiphany feast — the theme of the royal nuptials, the wedding of Christ with humanity. It is an idea on a completely different level from the historical events which the Epiphany celebrates, yet inextricably bound up with them; for example, the historical marriage feast of Cana is used by the Church to suggest the setting for Christ's nuptials with the Church; the wise men represent not only the three Persian Magi adoring the Babe 2000 years ago at Bethlehem, but also the Gentile world hurrying to the wedding feast at the end of time when mankind's nuptials with the divine Bridegroom will be celebrated; the gold, frankincense and myrrh are not only tokens for the little Baby King in the stable, but royal wedding gifts for the mystical marriage feast of heaven. Read more about the history and traditions related to the Feast of the Epiphany, and how it is celebrated in the parish, the home, and the Apostolic group. Find out why and how you can participate in this beautiful custom.